The BBC Big Concert presents the world premiere of 'ROOTS' featuring guitarist Craig Ogden and the Ulster Orchestra. The world premiere of Ciaran Farrell's latest work for guitar and orchestra entitled 'ROOTS' will take place on Sunday the 13th of June in Belfast's newly renovated Ulster Hall . The new, 4 movement work, will be performed by internationally acclaimed guitarist Craig Ogden and the Ulster Orchestra. Commissioned by BBC Radio 3, (with additional funds from the Arts Council of Ireland,) this new work will be the centre piece of a concert that will form part of a greater series of concerts running throughout the day as part of the BBC's showcase of it's performing groups. The Ulster Orchestra slot will be between 9:30pm and 11pm on that day. BBC Radio 3 will clear its schedules for The BBC's Big Concert, more than ten hours of live music-making from the BBC's performing groups across the UK . More than 400 BBC musicians play live from six cities, performing a huge range of music spanning more than 400 years of history. The ambitious relay of live music-making begins in Salford with the BBC Philharmonic at 11.30am.The baton passes to the BBC Symphony Orchestra in its Maida Vale home in London before going to Glasgow, where it is picked up by the BBC Scottish Symphony Orchestra. The BBC National Orchestra and Chorus of Wales continue the relay in Cardiff , before it goes to the BBC Concert Orchestra in Plymouth , then back to London for a BBC Singers performance in St Paul 's Knightsbridge. The day of live music culminates in Belfast with performances of Prokofiev's Symphony No. 1, Coplands's Appalachian Spring and the world premiere of Roots by Ciarán Farrell. The concert will be conducted by David Porcelijn. Australian born guitarist Craig Ogden is one of the most exciting artists of his generation. He studied guitar from the age of seven and percussion from the age of thirteen. In 2004 Ogden was honoured by the Royal Northern College of Music with a Fellowship in recognition of his achievements. He is the youngest instrumentalist to have received this award from the RNCM. Ogden's recordings for Virgin/EMI, Chandos, Nimbus, Hyperion and Sony have received wide acclaim. BBC Music Magazine dubbed Ogden 'a worthy successor to Julian Bream' and his debut solo CD for Nimbus Records of 20th Century Classics by British composers was nominated for a Grammy Award. 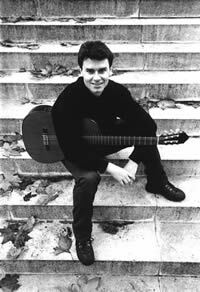 Craig Ogden has performed concertos with all of the main UK orchestras including the London Symphony, BBC Symphony, Royal Philharmonic, London Philharmonic, Philharmonia, Hallé, BBC Philharmonic, CBSO, RLPO and BBC NOW, and also in Russia, Sweden, South Africa, the USA, Latvia, and Australia. Craig Ogden regularly appears as soloist and chamber musician at the major London venues including the Queen Elizabeth Hall, Wigmore Hall and the Barbican and collaborates regularly with many of the UK's top artists and ensembles. David Porcelijn became chief conductor of the Sønderjyllands Symfoniorkester, Denmark, in September 2010. He is one of the most outstanding Dutch musicians of his generation. A most highly regarded orchestral trainer, he has held positions as Chief Conductor and Artistic Director of the Adelaide Symphony Orchestra, Chief Conductor and Artistic Director of the Tasmanian Symphony Orchestra, Chief Conductor and Artistic Director of the RTB Symphony Orchestra in Belgrade, Music Director and Conductor of the Netherlands Dance Theatre. He has also been professor in conducting at the Utrecht - Amsterdam Conservatoire and at The Sydney Conservatorium of Music. David Porcelijn has conducted the London Philharmonic Orchestra, London Sinfonietta, BBC Symphony Orchestra and the Philharmonia Orchestra in London and, elsewhere, the Sydney Symphony, Bergen Philharmonic, SWR Sinfonieorchester Baden Baden und Freiburg, Orquesta Filharmónica de Gran Canaria, NDR Radiophilharmonie and Polish National Radio Symphony Orchestra amongst many others in recent seasons. Beyond his work in core repertoire he also conducts new music throughout the world appearing, for example, with music of contemporary Chinese composers in three concerts at the Edinburgh International Festival. His work sees him conducting in three continents with major cultural organisations like Opera Australia, the Prague Spring Festival and the Orquesta Filharmónica de la Cuidad de México. David Porcelijn has a broad operatic repertoire and will be conducting Janacek's Jenufa this season in Belgrade. In 1992 he was awarded the prize "Best Opera Conductor" at the Munich Biennial for a production with Netherlands Opera. In 1994 he made his British operatic debut conducting Verdi's Oberto at Opera North. He made his Australian opera debut in 1991 conducting Rigoletto for the State Opera of South Australia, where he has since conducted Macbeth, La Traviata and John Adams' Nixon in China and, for Opera Queensland, Madama Butterfly. His work for Opera Australia at Sydney Opera House has included Lucia di Lammermoor, Rigoletto, Les contes d'Hoffmann and Il barbiere di Siviglia and, in co-operation with Opera Australia, he also conducted a semi-staged version of Rossini's 'La Cenerentola'. The Ulster Orchestra is Northern Ireland's only professional symphony orchestra and is based in Belfast. It has toured throughout Europe, Asia and the USA and is a regular visitor to the BBC Proms at the Royal Albert Hall in London. With an extensive concert season in Belfast's Ulster and Waterfront Halls, it also performs regularly across Northern Ireland with an annual season taking place in Dublin's National Concert Hall. With around 70 CDs recorded for Chandos, Naxos, Hyperion, BMG, Priory, Toccata Classics and BBC Music Magazine the Ulster Orchestra maintains a strong commitment to developing home-grown talent and building the audiences of the future, regardless of social, racial or financial disadvantagement.